Sciblogs | What does the OECD really have to offer us? What does the OECD really have to offer us? The Organisation for Economic Cooperation and Development (OECD) is often loosely described as “the rich countries club”. It isn’t an entirely accurate description – there are several high income oil exporting countries who don’t belong (as well as places like Singapore and Taiwan), and some countries that are members (notably Mexico and Turkey) aren’t particularly high income. But it is a grouping of mostly fairly advanced fairly open economies (New Zealand’s been a member since 1973). And the organisation claims to be able to offer useful advice to countries as to how to improve their economic performance. I’ve become increasingly sceptical of that proposition, especially as regards New Zealand. On a biennial cycle the OECD’s Economic and Development Review Committee (EDRC) meets in Paris to review each member country’s overall economic performance, and offers some specific advice both on general economic management issues and on specific topics agreed in advance between the secretariat and the country concerned. I wrote about the process, which draws on extensive staff work, on the day New Zealand was last reviewed in April 2015. The next review is almost upon us. 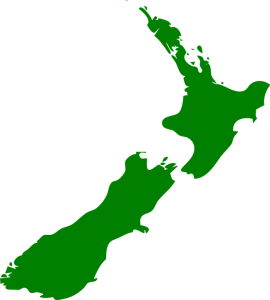 The EDRC is scheduled to discuss New Zealand on 20 April, so the draft text is probably already in the hands of New Zealand government agencies. The final text will presumably be released in late May or early June. This year’s agreed special topics are “Increasing Productivity”, and “Labour Markets and Skills”. The latter topic apparently includes the New Zealand immigration system, and when the OECD team came to Wellington last year I participated in a meeting with them, along with various government agency representatives, on some of the strengths and weaknesses of our system. Historically, the OECD tends to be very strongly pro-immigration – without much evidence for its benefits, especially in remote places like New Zealand – and I expect their treatment this time will again reflect that presumption, probably with some suggested tweaks at the margins. But, as often, the OECD might be able to present some cross-country data on the issues in interesting ways. Quite what they’ll come up with to increase productivity could be more interesting. In many ways, New Zealand is a test for whether the OECD has much useful to say. For a member that was once among the richest and most productive OECD economies and now languishes a long way down the league table, New Zealand has been a bit of an embarrassment to the OECD. After all, we did an awful lot of what they suggested 25 to 30 years ago. I’m writing about the issue because a few days ago the OECD released one of their flagship cross-country publications, Going for Growth. These documents often contain a lot of interesting cross-country comparative material – data collection and presentation is one thing the OECD defintely does well. But they also get specific, and have a couple of pages of economic policy priority recommendations for each country. Since the OECD must already have written their full substantive report on New Zealand for the forthcoming EDRC survey, one might have expected that the recommendations for New Zealand would be particularly incisive and well-focused, offering suggestions which, if adopted, would clearly help reverse our long-term underperformance. As they note, labour productivity gaps between New Zealand and the other advanced economies have continued to widen over the last quarter century. As the OECD’s own chart illustrates, real GDP per hour worked is now about 37 per cent below the average for the countries in the upper half of the OECD (these are countries from Luxembourg and Norway at the top, to Italy and the UK at the bottom). So what does the OECD propose for New Zealand? Reduce barriers to FDI and trade and to competition in network sectors. Recommendations: Ease FDI screening requirements, clarify criteria for meeting the net national benefit test and remove ministerial discretion in their application. Encourage more extensive use of advance rulings on imports and improve the publication and dissemination of trade information. Sell remaining government shareholdings in electricity generators and Air New Zealand. Remove legal exemptions from competition policy in international freight transport. Improve housing policies. Recommendations: Implement the Productivity Commission’s recommendations on improving urban planning, including: adopting different regulatory approaches for the natural and built environments; making clearer government’s priorities concerning land use regulation and infrastructure provision; making the planning system more responsive in providing key infrastructure; adopting a more restrained approach to land regulation; strengthening local and central government emphasis on rigorous analysis of policy options and planning proposals; implementing pricing to reduce urban road congestion; and diversifying urban infrastructure funding sources. Reduce educational underachievement among specific groups. Recommendations: Better target early childhood education on groups with low participation in such education. Improve standards, appraisal and accountability in the schooling system.To improve the school-to-work transition, enhance the quality of teaching, careers advice and pathways, especially for disadvantaged youth, and expand the Youth Guarantee. Facilitate participation of disadvantaged youth in training and apprenticeships. Students from Maori, Pasifika and lower socio-economic backgrounds have much less favourable education outcomes than others. Improve health sector efficiency and outcomes among specific groups. Recommendations: Increase District Health Boards’ incentives to enhance hospital efficiency, improve workforce utilisation, integrate primary and secondary care, and better managed chronic care. Continue to encourage the adoption of more healthy lifestyles. Raise effectiveness of R&D support. Recommendations: Further boost support for business R&D to help lift it to the longer term goal of 1% of GDP. Evaluate grant programmes. Co-ordinate immigration and education policies with business skills needs for innovation. The general goals seem fine, in as far as they go. And some of the specifics seem sensible enough too (others – more R&D subsidies, government encouragement of “more healthy lifestyles” – seem distinctly questionable). But could anyone with a reasonably in-depth understanding of the New Zealand economy and its performance over the last few decades, really think that that list, even if adopted in full, would really make a material difference in turning around New Zealand’s long-term productivity underperformance? I’m all for fixing the housing policy disaster, but when the OECD talks of the agglomeration gains that might make possible, have they actually looked at the dismal Auckland productivity performance over a period when Auckland’s population has already grown very rapidly? It is also quite surprising what they don’t mention. 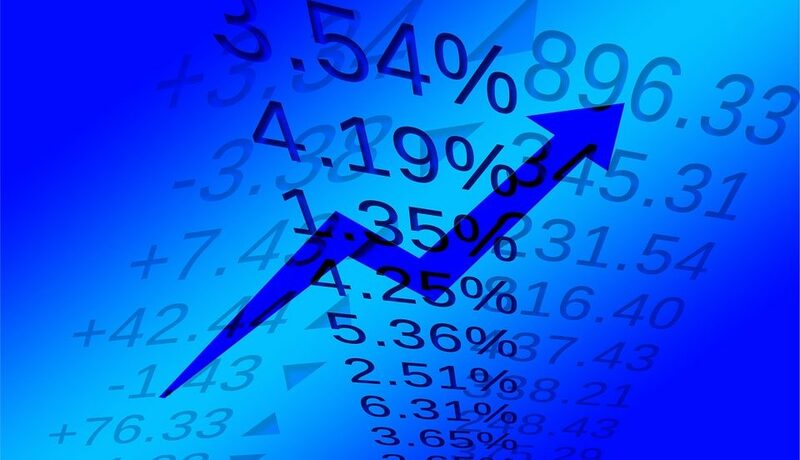 Perhaps macro imbalances, such as our persistently high real exchange rate, or our (typically) highest real interest rates in the OECD, don’t easily fit in a structural policy document – although they are significant symptoms that a list of possible structural policy remedies needs to notice. But the OECD does publish as part of Going for Growth quite a range of cross-country comparative data on various structural policy indicators. Even then there are puzzling omissions. There is nothing at all, for example, on immigration policy. And company tax is also missing. Here is the data from the OECD website on statutory company tax rates for 2016. 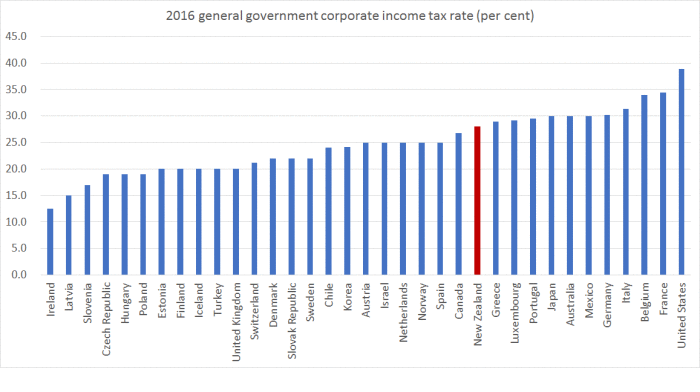 New Zealand is in the upper third of OECD countries – and with a company tax rate well above that group of countries (from the Czech Republic to Switzerland) at around 20 per cent. I’m all in favour of reducing FDI barriers, for example, but for many firms who might consider establishing here, the likely tax bill is probaly a more significant consideration. And I suspect it offers more payoff in improving productivity than the health system, whatever the merits of the specifics they propose there. It was also interesting that the OECD does not mention our labour laws. It is well-known that our minimum wage is quite high relative to median wages/labour costs. In fact, the OECD again illustrate it in their indicator pack. This is their chart, and I’ve simply highlighted New Zealand. It is a quite a stark picture, but doesn’t seem to be a priority issue for the OECD. Actually, I doubt altering the minimum wage laws offers very much on the productivity front, but even if one is simply concerned about disadvantage (as they very much seem to be) we know that getting people into jobs is the best path towards longer-term economic security. One needn’t go to the US end of this spectrum, but places like the Netherlands and Belgium aren’t exactly known as bastions of heartlessness, small government or whatever. Overall, I think the list still suggests the OECD has very little idea what has gone wrong in New Zealand, and hence has little more than a generalised grab bag of ideas to offer in response – many no doubt quite useful in their own way, but mostly likely to be tinkering at the margins. Out of curiousity, I had a look at what they had to recommend for the previous country on the (alphabetical) list – the Netherlands. It is an interesting country too. Productivity – GDP per hour worked – is above that for the group of countries in the upper half of the OECD. Indeed for decades productivity levels in the Netherlands have been very similar to those in the United States. Per capita income lags a bit behind, because Dutch people on average don’t work long hours each year (although the participation rate is high). But it is, by most counts, a very successful economy. Real GDP per hour worked is about 65 per cent higher than in New Zealand. What does the OECD recommend for them? Lower marginal effective tax rates on labour income. Ease employment protection legislation for regular contracts and duality with the self-employed. Reform the unemployment benefit system and strengthen active labour market policies. Setting aside the OECD’s taste for R&D subsidies, it mostly seems sensible, plausible, and well-targeted. They seem to have a better idea what to offer an already rich and successful country in the heart of Europe, than they have to offer a once-rich now-underperforming remote one. For us, that is a real shame. One can only hope that when the productivity chapter of the forthcoming New Zealand economic survey comes out, they can offer a more persuasive grounded set of recommendations as to what might make a real difference in reversing our decades of underperformance.